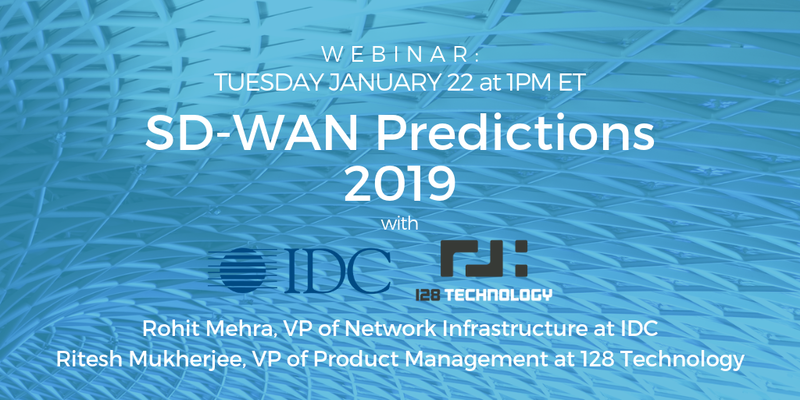 Rohit and Ritesh will discuss the important trends for SD-WAN in 2019. Rohit Mehra is IDC's Vice President of Network Infrastructure, leading IDC's research practice in Enterprise and Datacenter Networks, and Telecom Infrastructure. He provides expert insight and analysis into global industry and technology trends as they relate to enterprise, datacenter, cloud and telecom networks including areas such as Ethernet switching, routing, wireless, application delivery and WAN Optimization, amongst other technology domains. Dr. Ritesh Mukherjee leads Routing strategy at 128 Technology. His expertise includes routing and switching, Data center, Cloud, SDN/NFV, and IoT. Prior to 128 Technology, Ritesh was Director, Network Solutions at Huawei leading the technical solutions team and Manager, Product Management at Cisco leading the software operating systems group. Ritesh holds a PhD in Computer Science from Concordia University, Montreal.